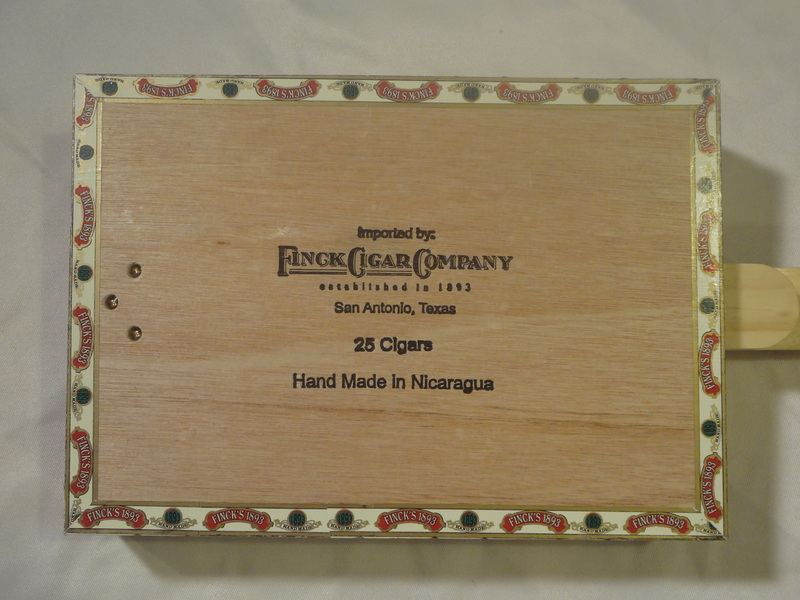 We love Finks boxes, partly because they are great sounding boxes and partly because they are based right here in San Antonio. 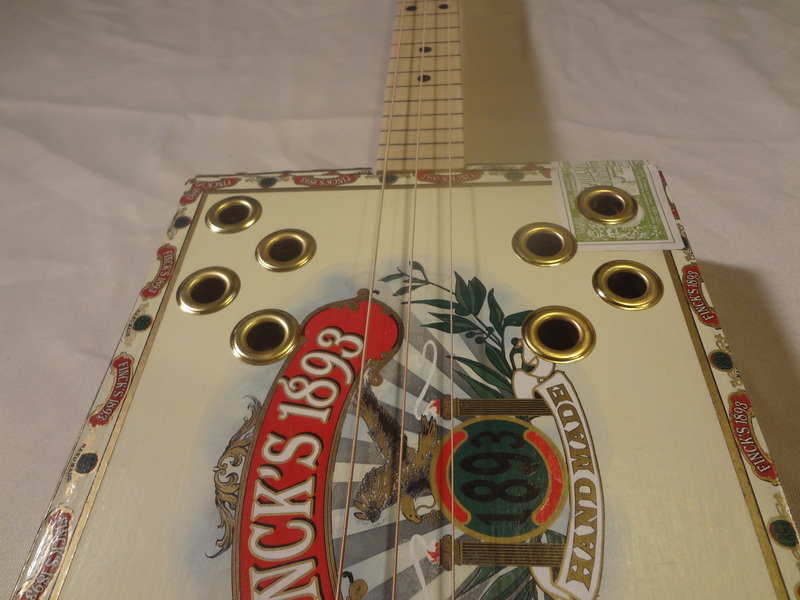 The 1893 boxes have a nice vintage look and they have a nice thin top so you get a wonderful tone. 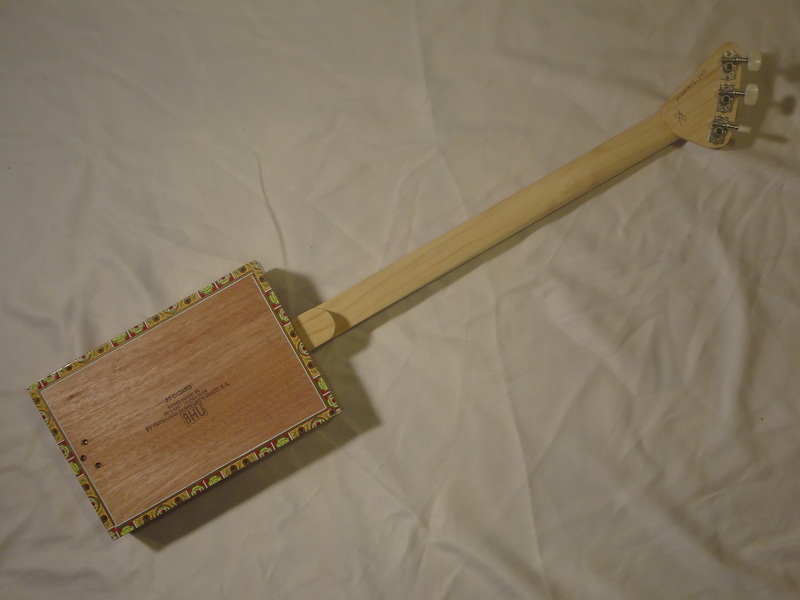 This is a big box so you get lots of volume and we cut eight sound holes to let all that sound out. 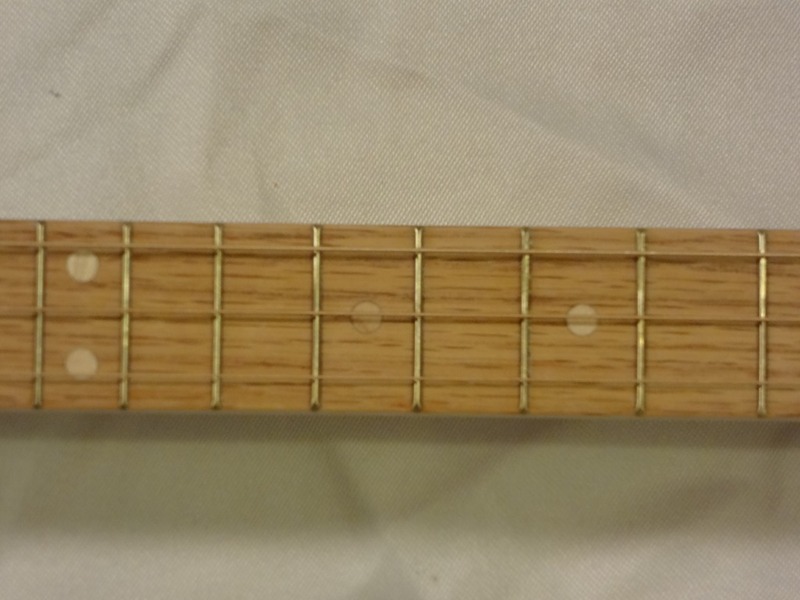 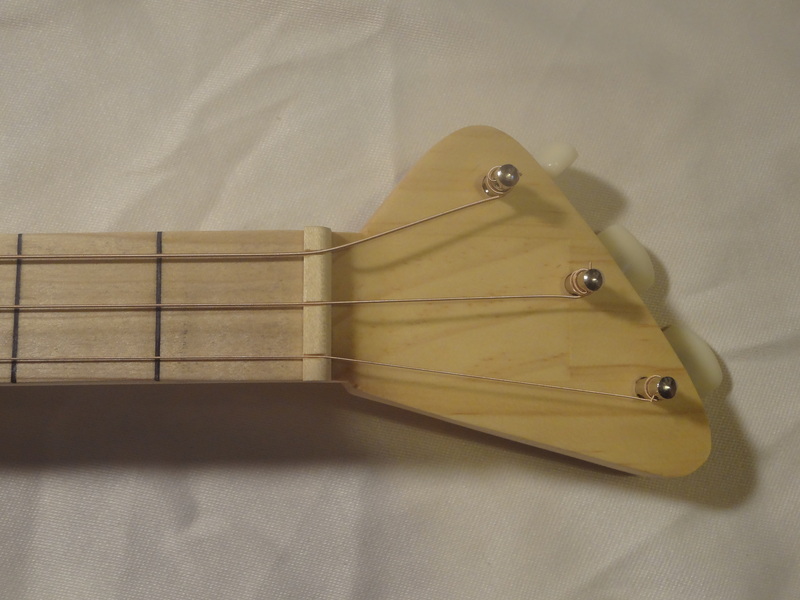 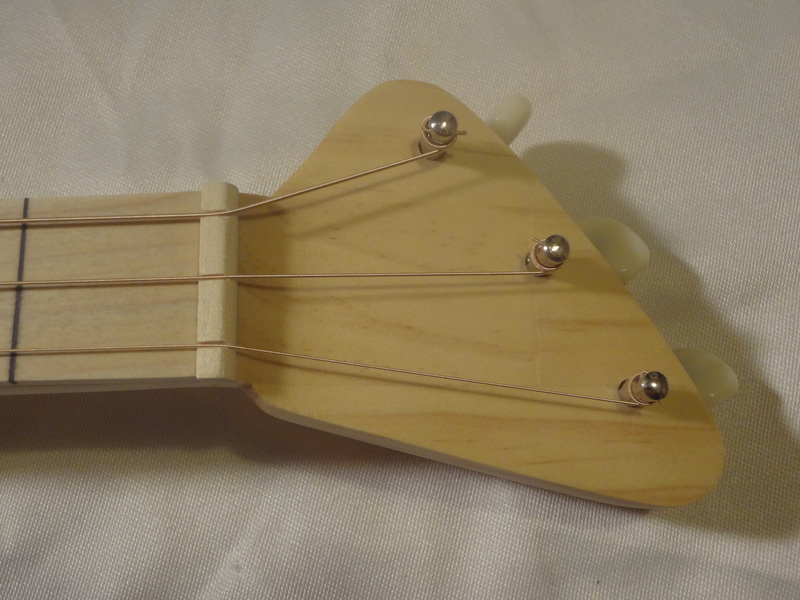 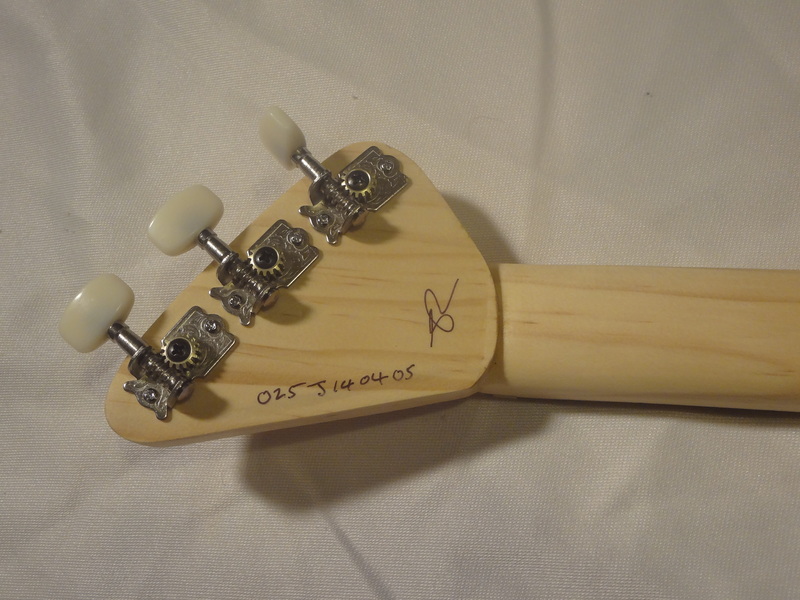 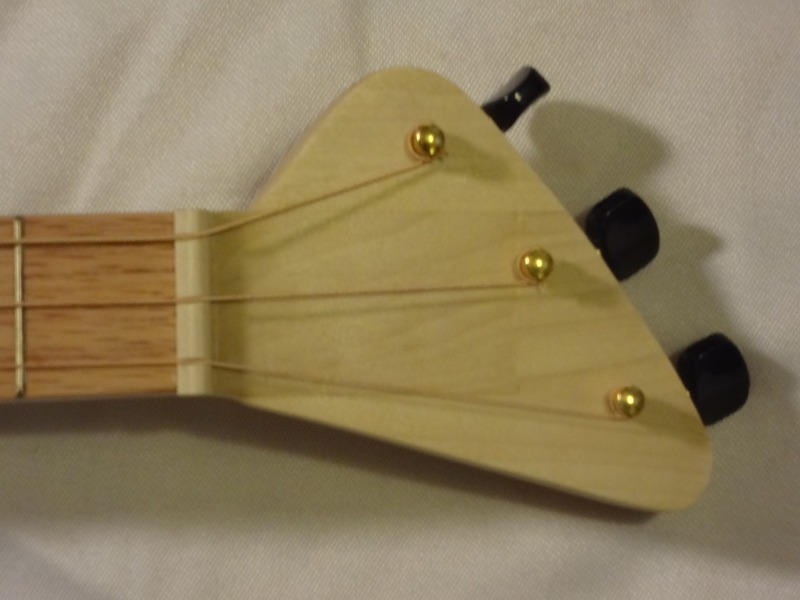 Nice simple Yellow Pine neck with a Poplar fret board and black inlay fret lines and fret markers. 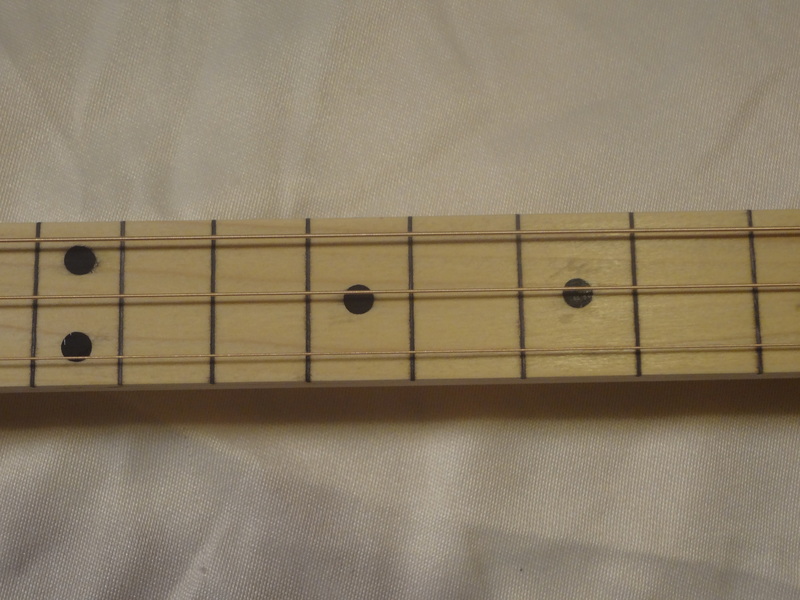 This is a really nice sounding guitar, if your looking for a fret-less with a great look then this one is for you. 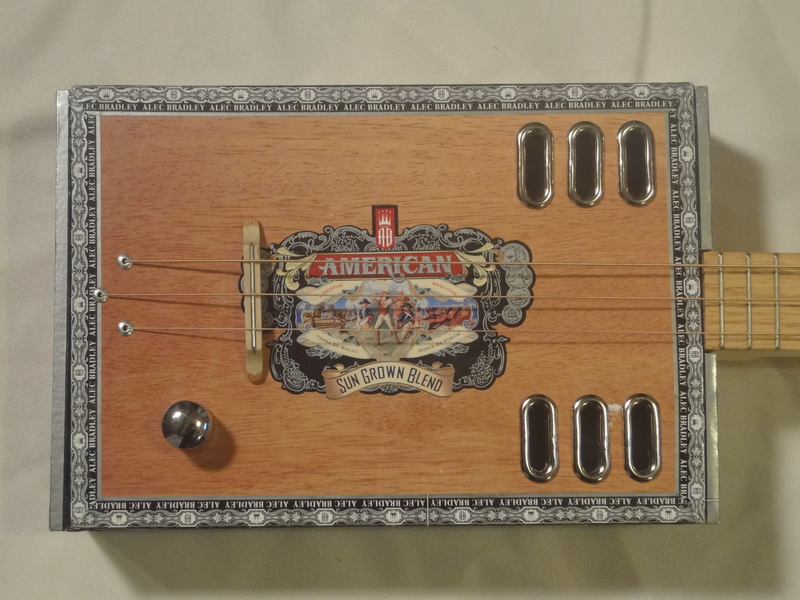 We are fast running out of these tins for our one string canjos. 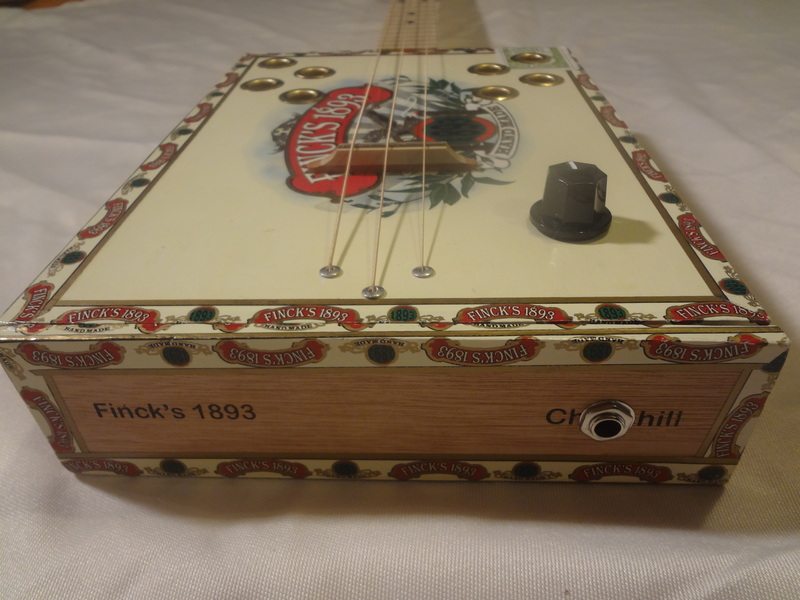 We added a sound hole to this tin and it really helps give more acoustic volume and rounds of the tone a little. 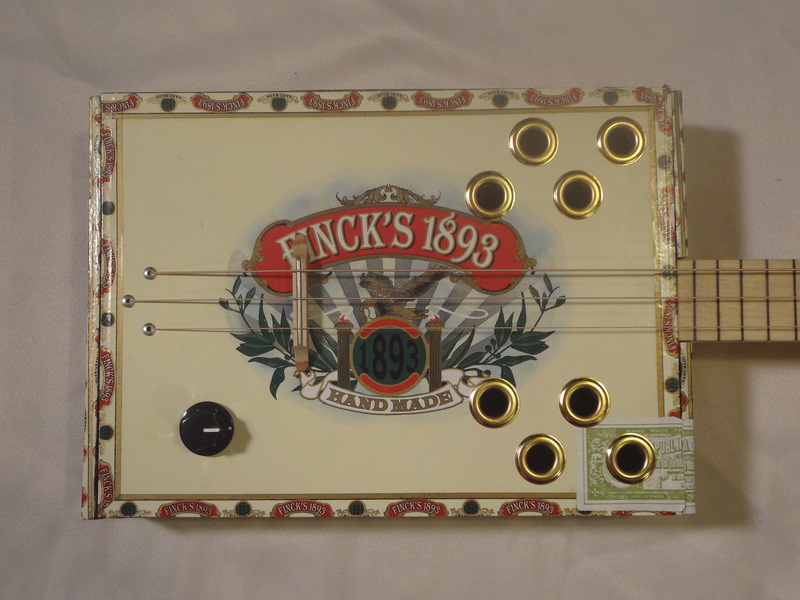 All in all a great build and so much fun to play, once you pick it up you wont want to put it down. 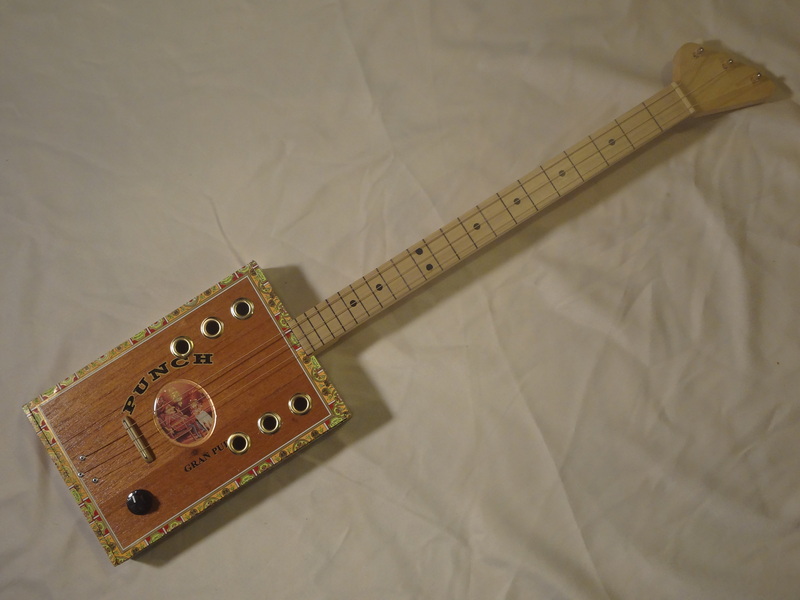 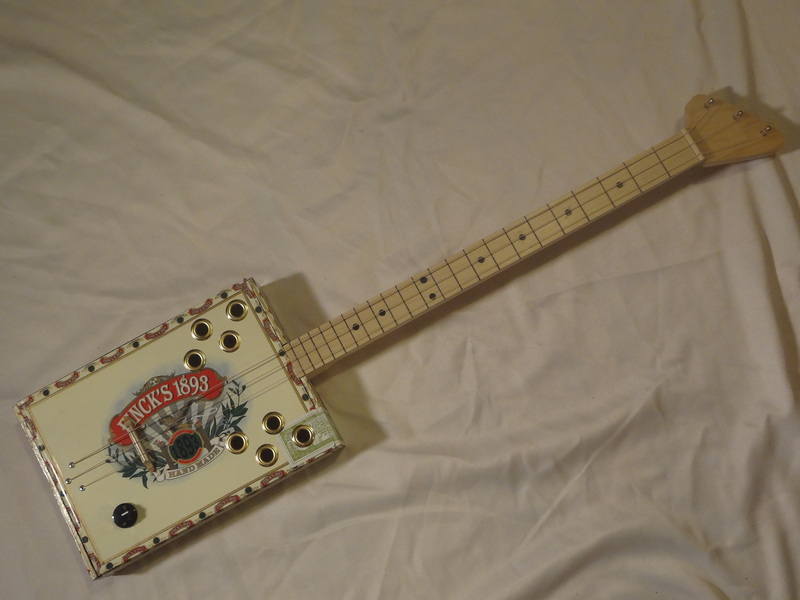 Fret less Cigar Box Guitars are just fun and this one is no exception. 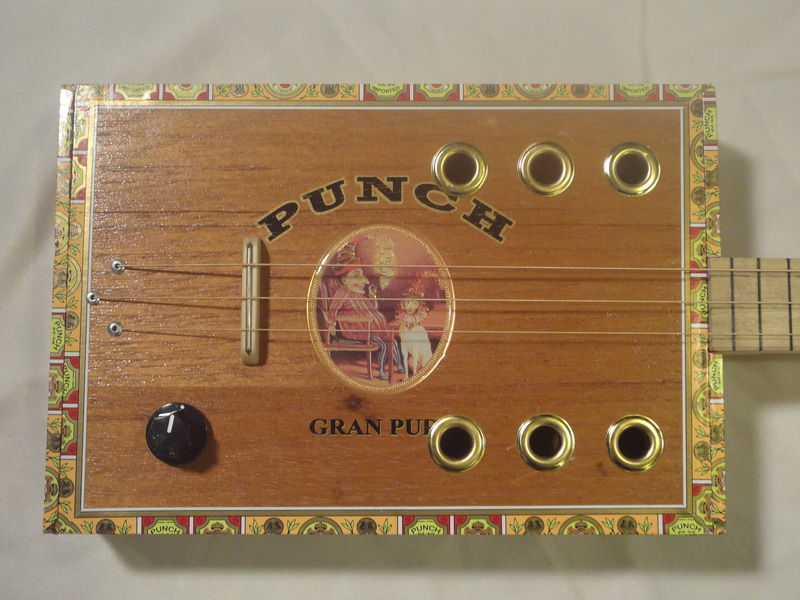 Great looking Punch box, tons of character and an awesome picture, front and center, of Punch himself kicking back with a cigar. 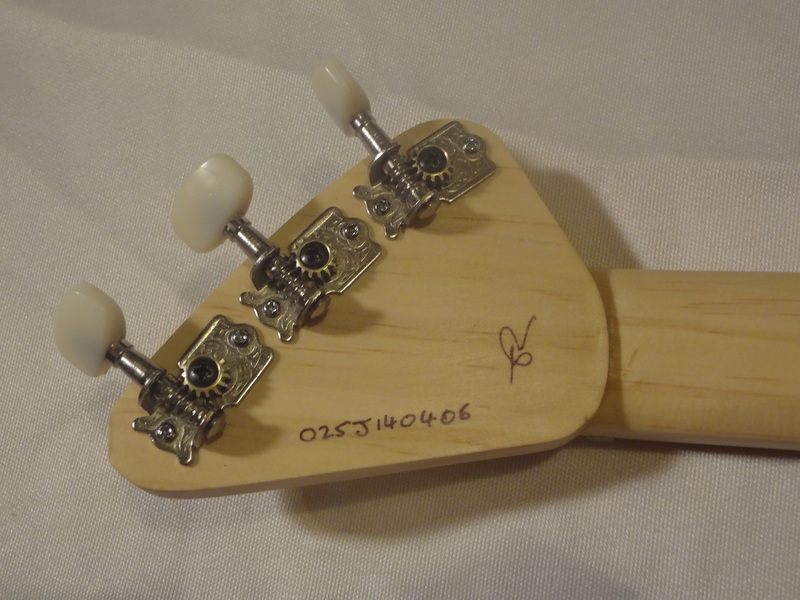 Not only is she a looker but she sounds just as good, plenty of tone and sustain, a rich full sound that only gets better when you plug her in. 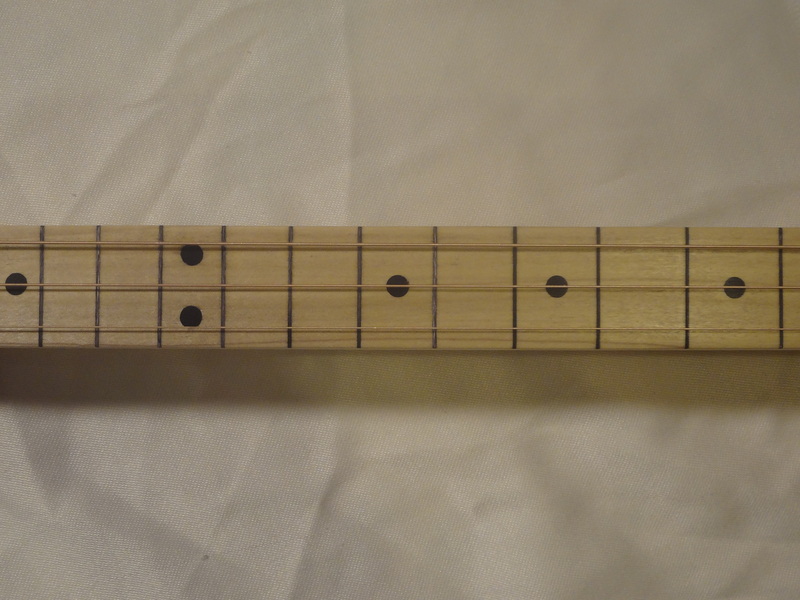 We kept the neck nice an simple, Yellow Pine with a Poplar finger board, bold black inlays let you know what fret you are at without being over powering. 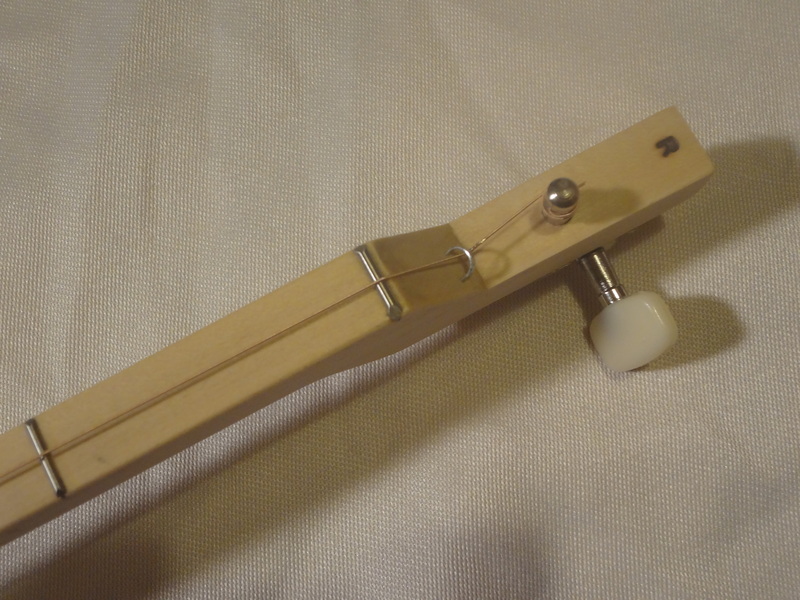 We set the action high enough to play with a slide but low enough that you can still use your fingers, once you pick her up you wont want to put her down. 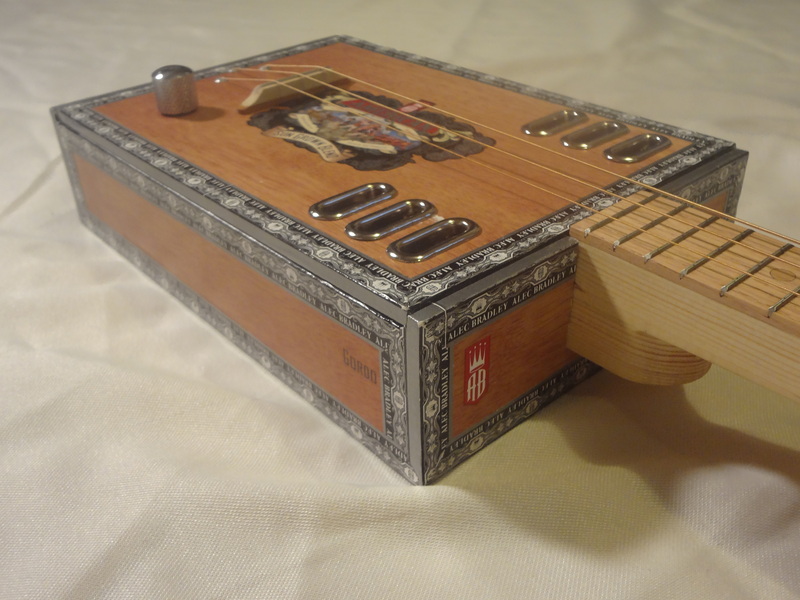 This is a nice heavy box with a wonderful sound. 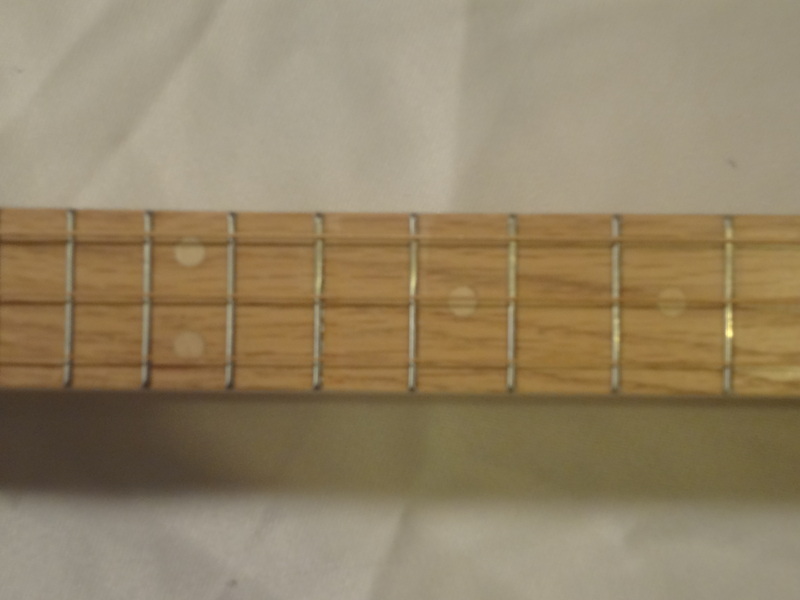 We used a nice Yellow Pine neck with beautiful grain, topped with a Red Oak fret board that looks great with the wood grain style of the box and added Maple fret makers for a nice subtle look. 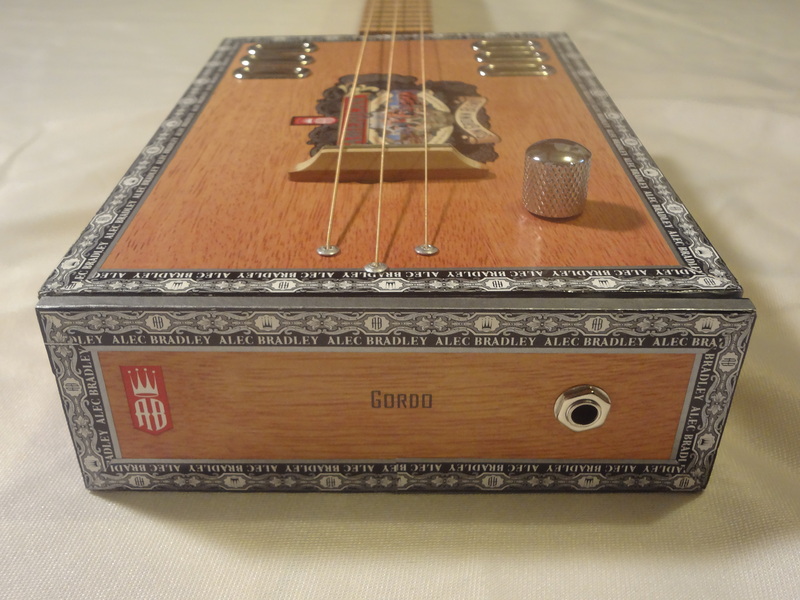 On the box we used our chrome look elongated grommets for the sound holes and chrome volume knob to finish everything off. 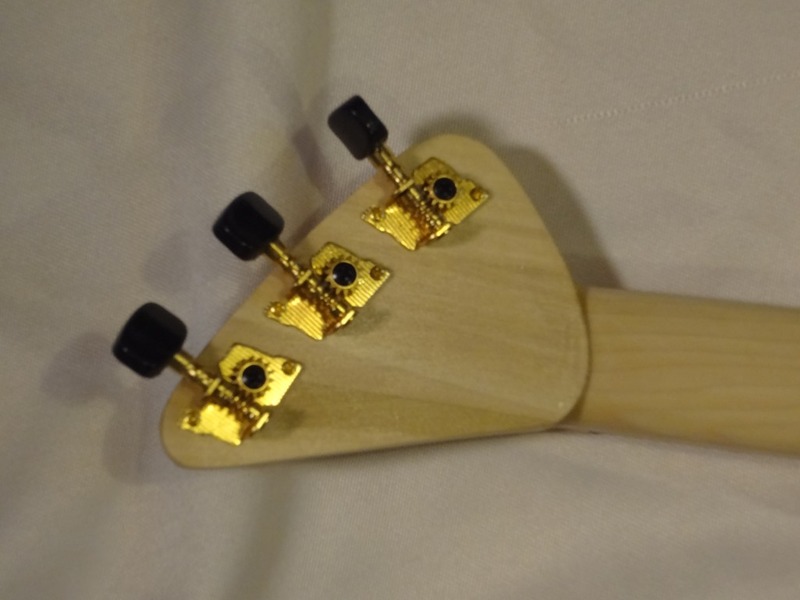 Sound wise she has a great deep tone and plenty of volume, plugged in she has and the growl and attitude you could ask for. 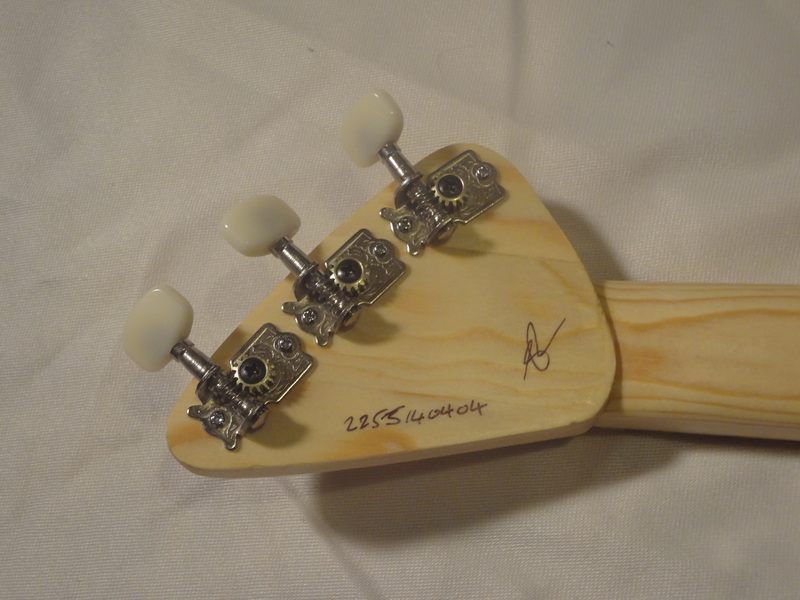 All in all a great guitar with a nice comfortable 22.5″ scale. 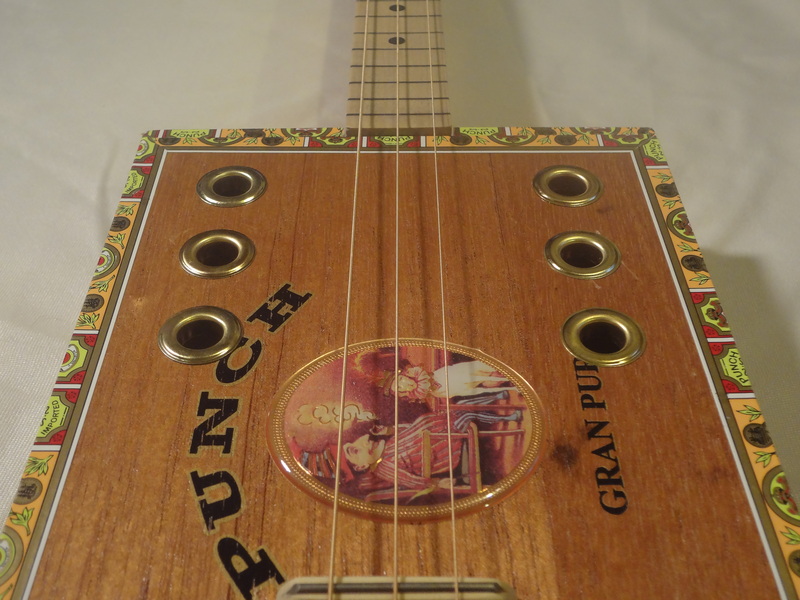 **SOLD** She’s on Etsy and EBay, go get her! 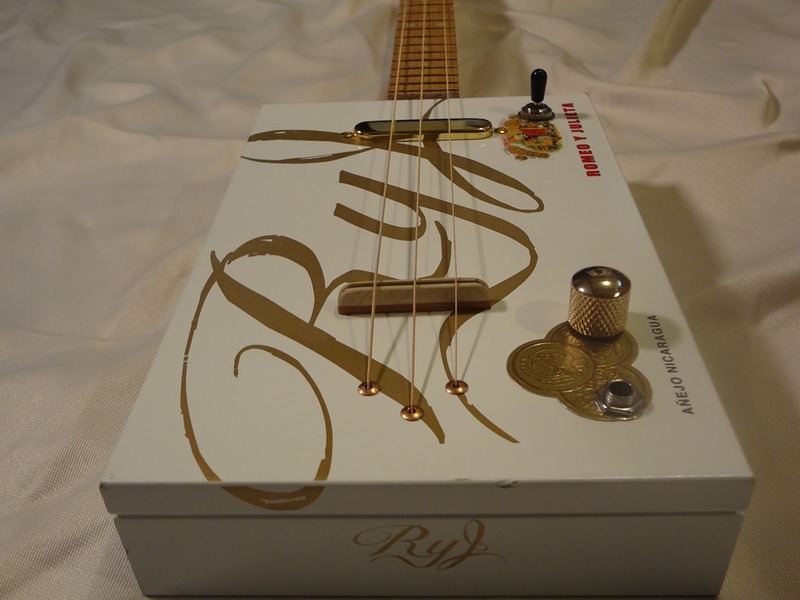 This a great box, nice and solid, good weight to it but still has a thin top for a great tone. 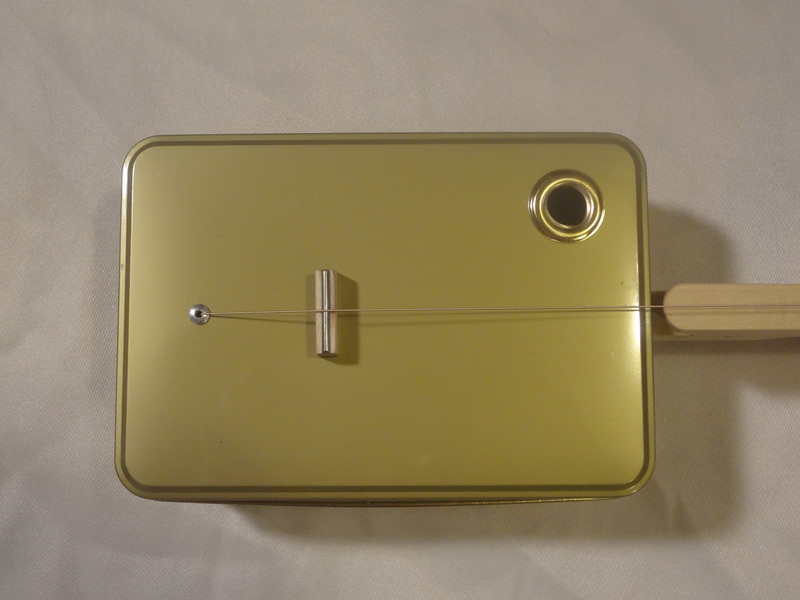 We loved all the gold on the box so we pushed the boat our and went all the way with this little lady. 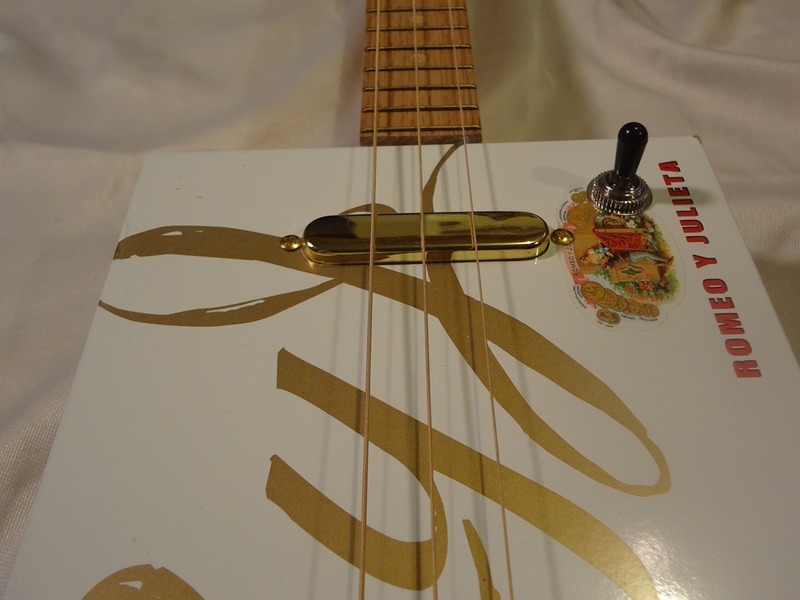 We used gold tuners, frets, neck pickup and volume knob to carry the gold through out the whole guitar, and let me tell you, she looks stunning, a real head turner. 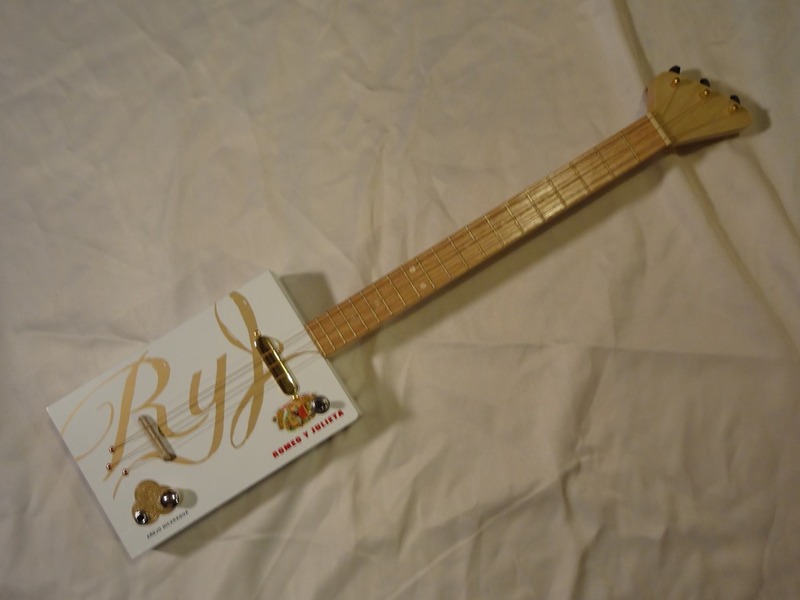 Not only does she look good be she sounds amazing, you get two pickups in this one, a piezo down by the bridge and a telecaster neck pickup. 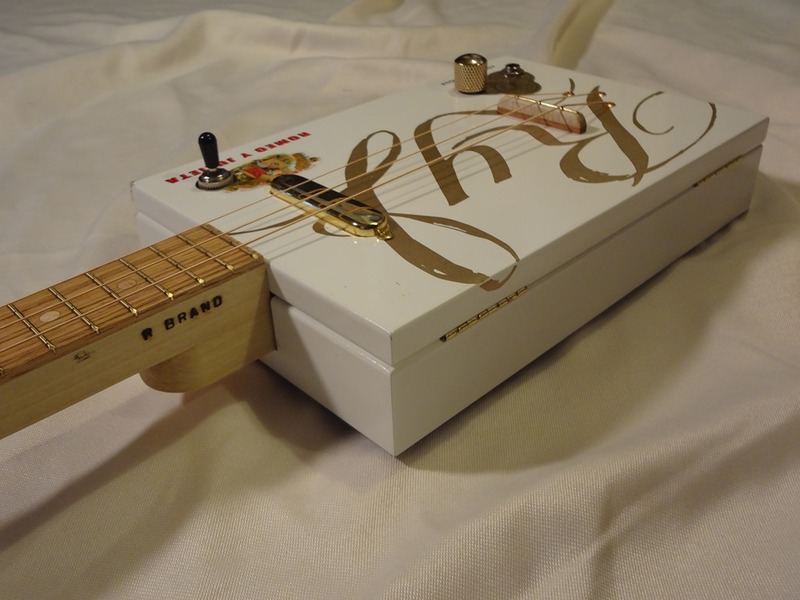 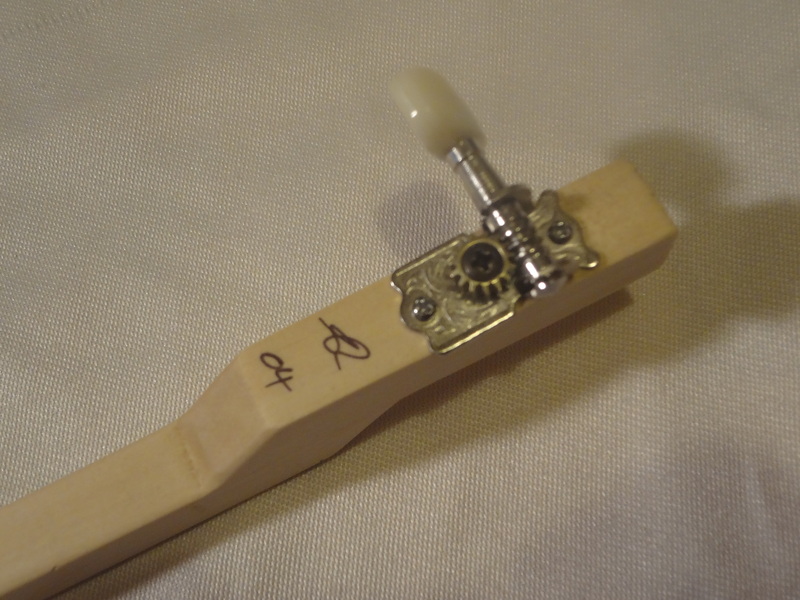 The difference between the pickups is night and day, the piezo gives you all the CBG twang you could want and the neck pickup up offers a warm rhythm sound or set the switch in the middle and get the best of both worlds. 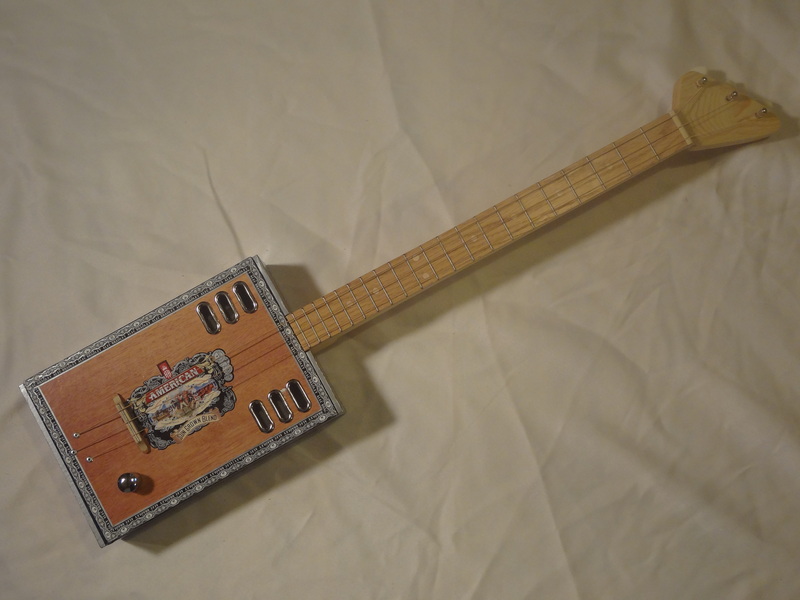 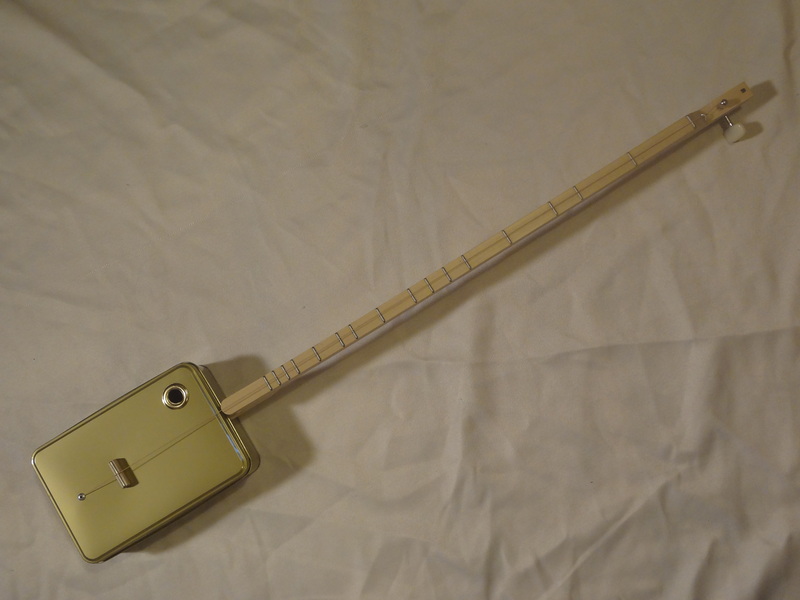 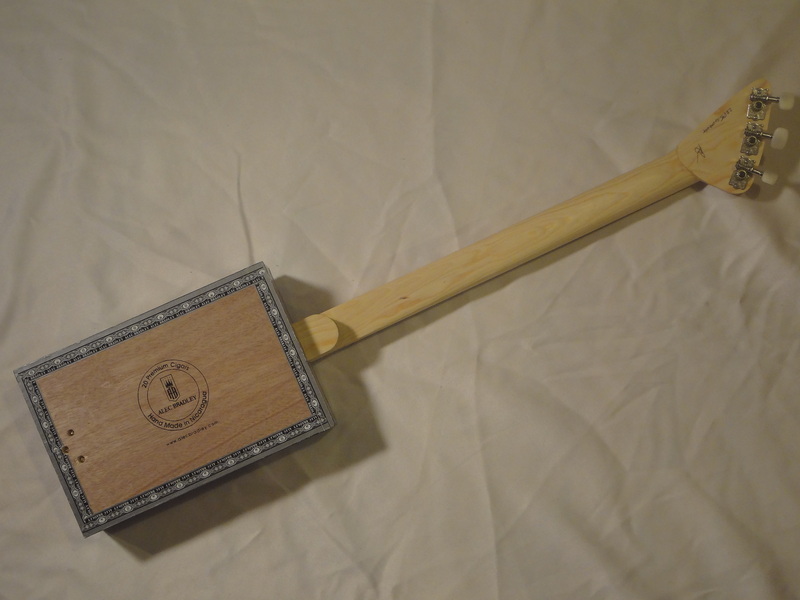 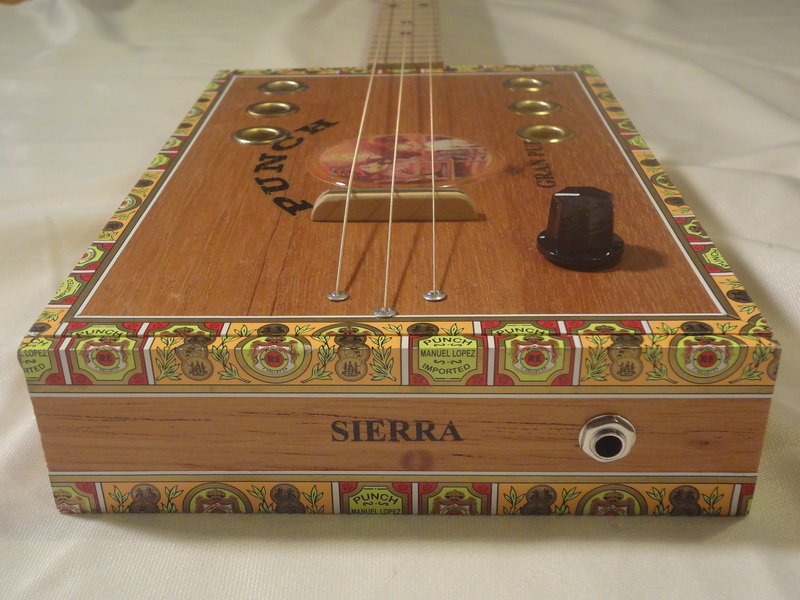 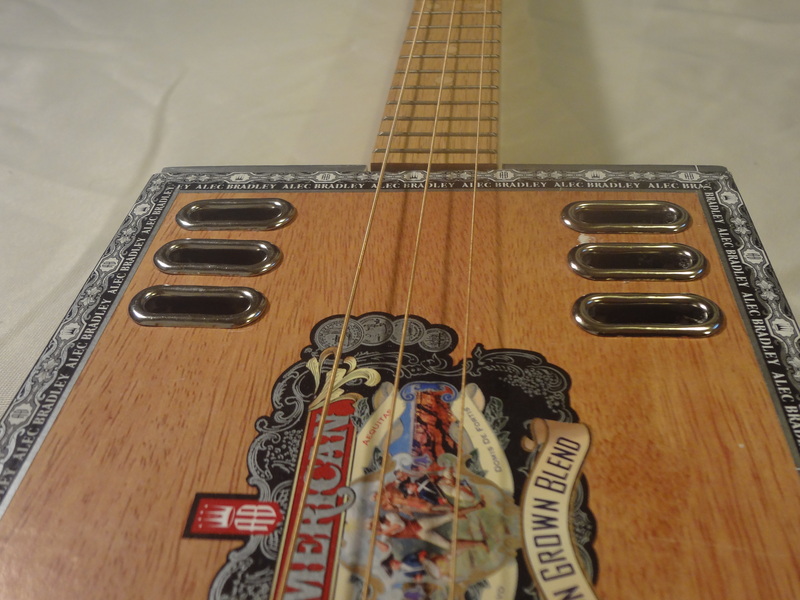 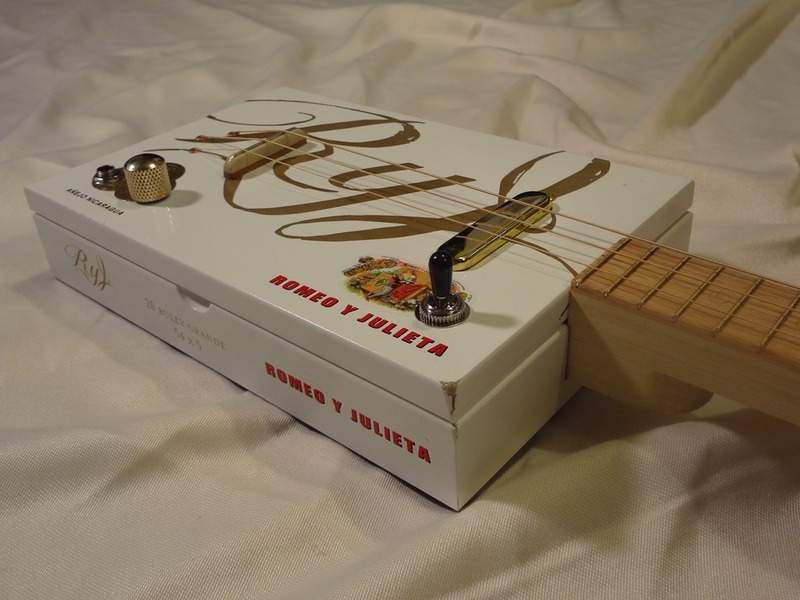 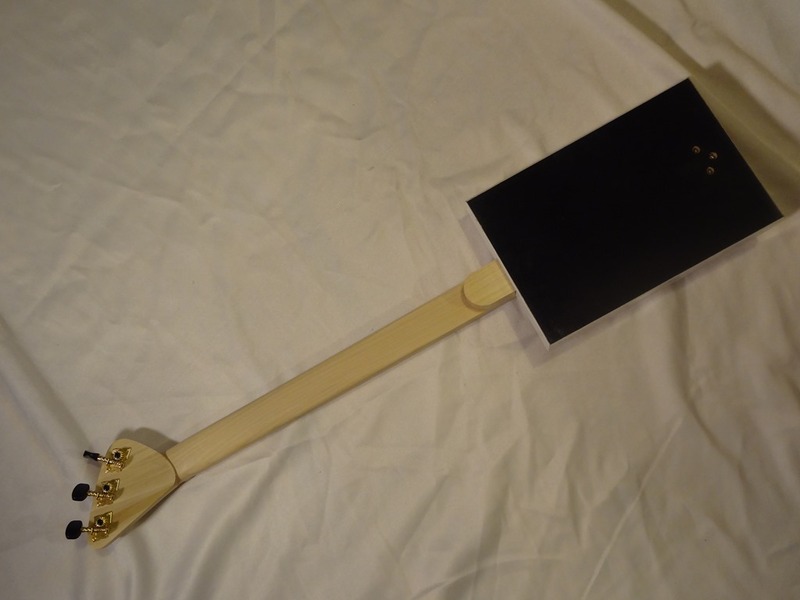 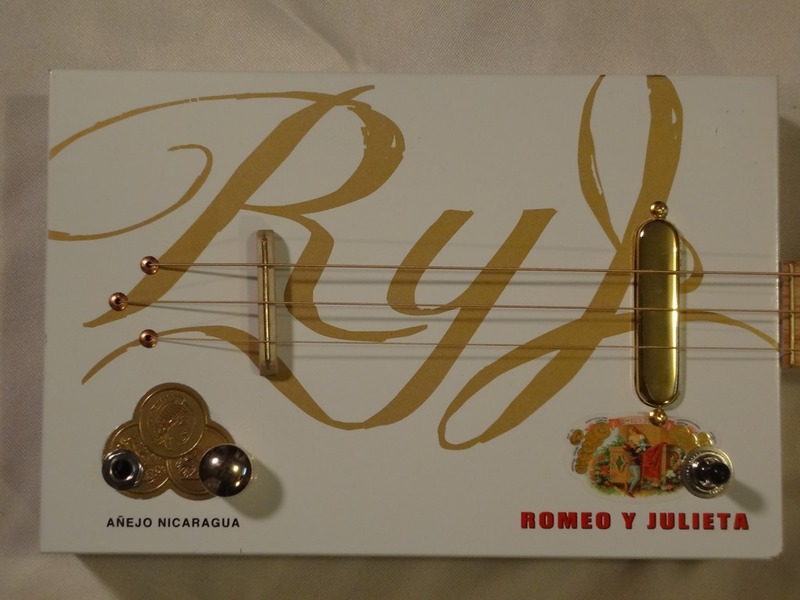 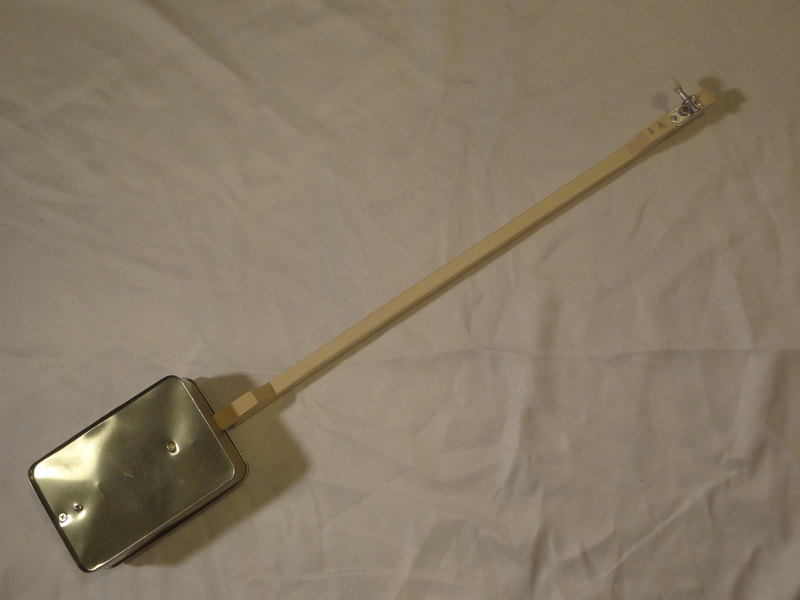 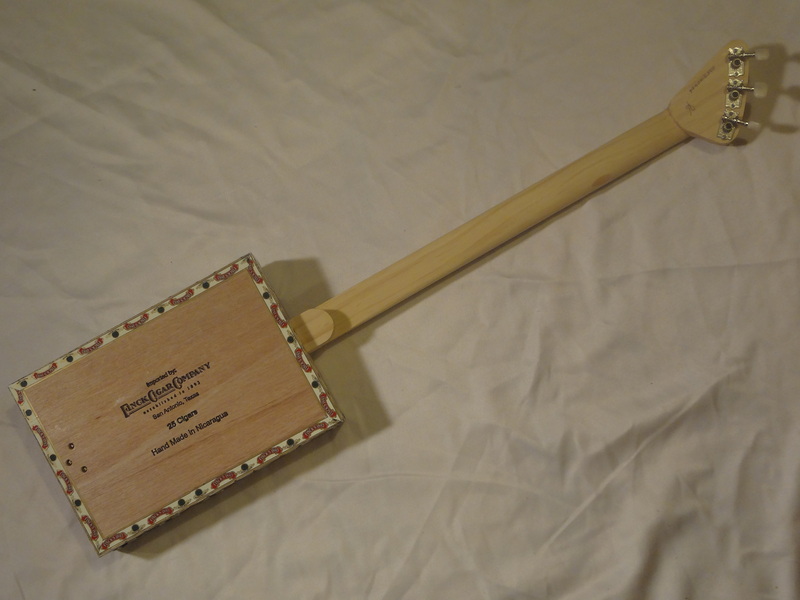 This is a great, fully loaded cigar box guitar with a wonderful range. 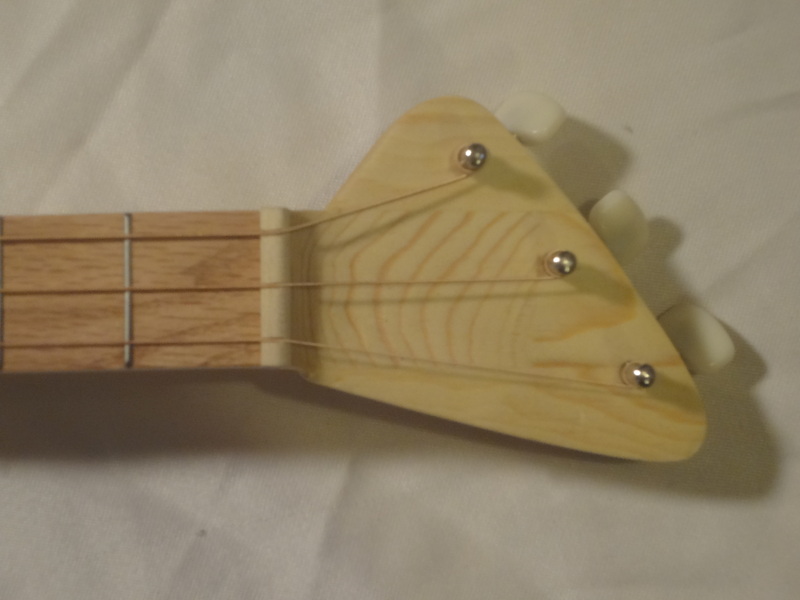 **SOLD** Shes on EBay and Etsy, take you pick just make sure you get her before someone else does.